Theme From M*A*S*H (AKA Suicide Is Painless) is on Bill Evans' classic 1981 solo LP You Must Believe In Spring. In 2009 you must believe in hype. More on the late, great Bill Evans here. 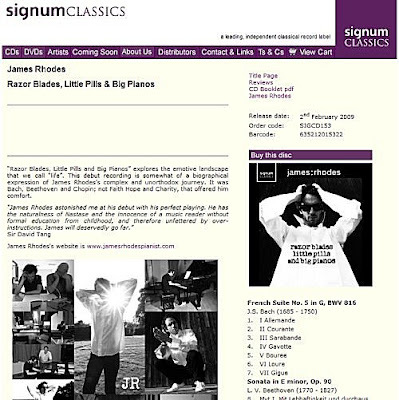 You will see that James Rhodes' musicianship receives a resounding endorsement from Sir David Tang on the Signum Classics website. Who is Sir David Tang? Sir David Tang ... is a Hong Kong businessman and socialite best known as the founder of the Shanghai Tang chain ... Known for his love of Cuban cigars, Tang is also Honorary Consul of Cuba in Hong Kong ... Tang is the founder of the China Clubs (Hong Kong, Peking and Singapore), the Shanghai Tang stores, Havana House and Pacific Co Ltd (the exclusive distributor for all Havana brands in Canada, Asia and Australia). More recently Tang opened the Cipriani in Hong Kong and the China Tang restaurant at the Dorchester Hotel. Tang is also a director and advisor to a number of boards which include Tommy Hilfiger.